Ecosystems depend on pollinators to fertilize flowers, and help produce fruits that many animals depend on for survival. Similarly, humans are just as dependent on pollinators to grow crops. Pollinators are responsible for a third of what we eat. There are a variety of native bee pollinators found in the United States. Compared to honey bees, native bees differ in both size and shape, and are often misidentified as other insects. Pollinators, in particular bee species, have been documented to have reduced biodiversity and abundance. With the decline of pollinators in natural environments, interest has increased in pollinators in urban environments. 1) how does bee community composition and floral richness change seasonally in native, urban gardens; 2) how are local garden variables (garden area, and floral density) associated with bee diversity and abundance? 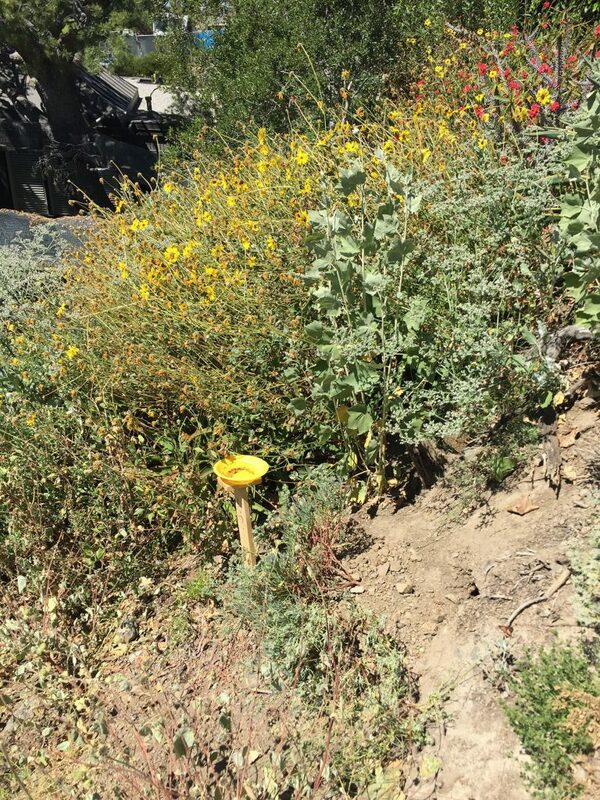 This study is being conducted in urban/suburban gardens in L.A. County. The Gottlieb Native Garden is one of six sites. Its vast diversity and abundance of native plants present in the garden, make it an ideal location to study bee pollinators. 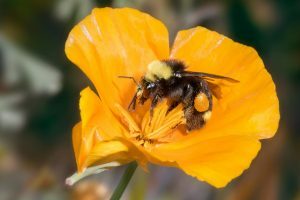 Native plants have demonstrated to be more attractive to native bees and attract more unique bees compared to non-native plants. Six sites used in this study include front/backyard gardens that range in areas between 185-1114 m². Sampling is being accomplished using small insect collecting traps and is done every 7-8 weeks. The small traps consist of yellow plastic bowls 15 cm wide and 4.5 cm deep. Each bowl is filled with soapy water. Bowls are mounted on 45-50 cm tall wooden stakes hammered into the soil. Bowls are placed throughout the garden about 5 meters apart. The bowls are set up between 9AM–12PM and collected 48 hours later. Hand-netting is done for 30 minutes on sampling days. Field work is done with the assistance of undergraduate students from Cal Poly Pomona. The collected samples are transported to the Entomology Research Lab at Cal Poly Pomona to be identified. In the lab students provide assistance with mounting and pinning techniques. Flower densities by species are measured using a .25 m² quadrat. Quadrat frames are randomly placed throughout the garden. Pictures are taken of flowers within each 0.25 m² quadrat and the total number of flowers heads are counted. 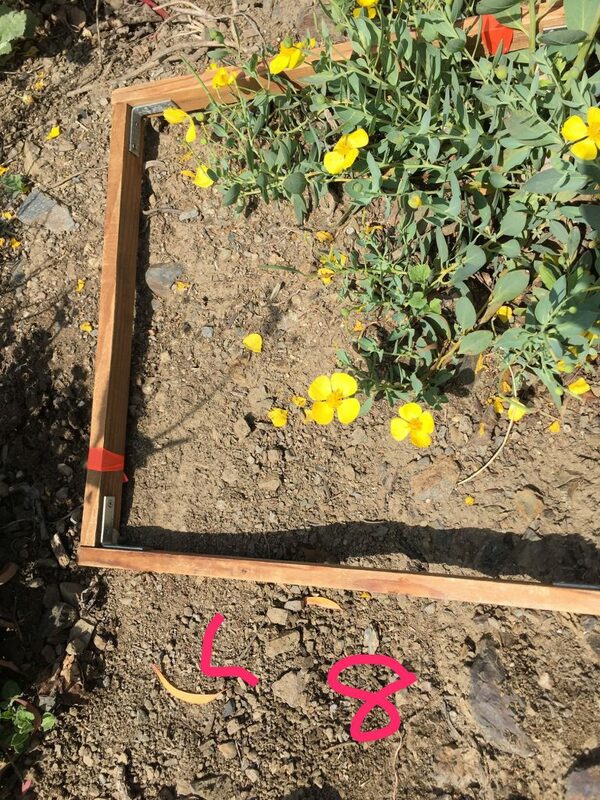 Shows 0.25 m² quadrat used to estimate flower density. Shows a yellow bowl set up in the Gottlieb Native Garden. The Gottlieb Native Garden is not only providing a site that will contribute to a Master’s project, it is also providing a site for undergraduate students to gain experience collecting data, processing specimens, and increase their awareness of native bees and plants.